Click on the Video Link below to see them in action. Each and every set of KISS Platform Boots are custom made, by hand and at the time of ordering. This means that we do not carry stock as this is not mass produced 'upfront' merchandise. 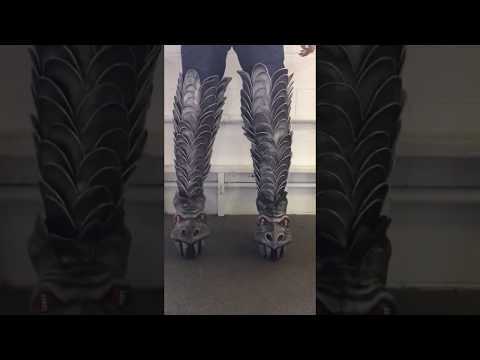 Great care goes into every manufacturing aspect of your KISS REPLICAS' Demon DESTROYER Boots, right down to the hand painted Dragon Head Shell Details and Eye Stones. Quality, Accuracy and Functional KISS Costumes. We'll let our passion show in the products we produce. Very accurate to the stage worn boots used by the Demon himself Gene Simmons during the Destroyer Tour. Scales are sized and shaped to accurately mimic the curved beauty of the stage worn boots of that era. Scales are shaded individually by hand so no two share the same weathered look or principle of shading, just like the real stage worn boots. Leggings are one size fits all as they're designed to fit over the platform boot leg base. The size and shape of the scales, and the nature in which our leggings are assembled easily allows for 1 standard size to work with all leg types. Heavy duty side zipper hidden behind a vertical strip of Velcro. Zipper 'zips up' from the top down. That's right, no more fussing with leggings to stay up while you put them on. Zipper zips from the top down. *Once you've determined your required boot size; after clicking the box agreeing to have used our size chart a drop down menu will appear allowing you to select your boot size.